As well as being providers of spares at our unit, we service and MOT bikes. We service and MOT most Japanese bikes as well as Triumphs. We are now pleased to offer a Hyperpro service centre to upgrade your standard suspension. We can also offer the Lazertrack Setting Unit to make sure your bike goes in the direction it's meant to! Lazertrack is a new British product designed to take the guesswork out of motorcycle wheel alignment. Using lasers to check the relationship of front and rear wheels to within fractions of a degree and allowing the operator to make accurate adjustments to correct an out-of-line condition. Misalignment due to frame damage can be quickly detected. Advice is freely given if you are uncertain on a product or spare part. 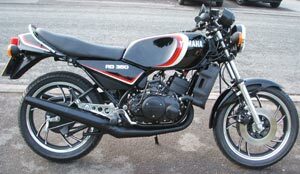 We specialise in seasonal restorations of Yamaha RD250/350 LCs. Please phone to make an appointment.